Presiding Officer Norma L. Gonsalves (R-East Meadow, LD 13) recently attended the Annual Inspection and Installation Ceremonies of the North Bellmore Fire Department at the Huntington Hilton Hotel in Melville. The ceremony is held to install the new officers of the Fire Department and honor past officers as well. Presiding Officer Gonsalves presented a citation to Outgoing Chief Mark L. Collins in recognition of his distinguished service. 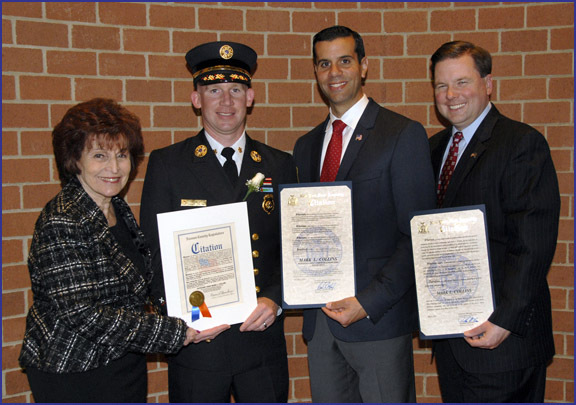 Pictured (l-r): Presiding Officer Norma L. Gonsalves; North Bellmore Fire Department Outgoing Chief Mark L. Collins; Nassau County Legislator Michael Venditto; and Assemblyman Tom McKevitt.